The FIH Hockey World Cup 2018 being held at Kalinga Stadium, Bhubaneswar, has set the excitement level soaring by several notches. With nail-biting thrillers, surprising upsets and classic hockey displayed even in the one-sided affairs, the current edition, revamped with a blue turf and modern rules, is anything but a drab affair. While every match is watched with bated breath around the world, the most anticipated ones are those involving the hosts, Team India. The Men in Blue had a crucial match with Canada, and had to beat them at any cost to go directly to the quarter-finals. Since Belgium whacked the South Africans 5-1, India had to win this match by nothing less than a margin of 2-1. Coached by Harendra Singh, the boys began on the right note, earning a goal within the 1st quarter, when Harmanpreet Singh did not let go of the penalty corner, giving India a crucial lead. However, they were surprisingly held up by Canada for the next one quarter, with Floris Van Son even scoring the equalizer in the third quarter. For a while, it looked as if India would be forced to be content with the crossover stage. However, it wasn't to be so. India went on attacking mode from the first whistle. Making apt penetrations, and with an improved stickwork as compared to the previous match, India dominated the first quarter. The home crowd, packed to the brim, got a reason to cheer as Harmanpreet scored within the first quarter itself, giving India a crucial lead of 1-0. In the 12th minute, India, who had made almost 5 to 6 circle entries by then, earned their first penalty corner. 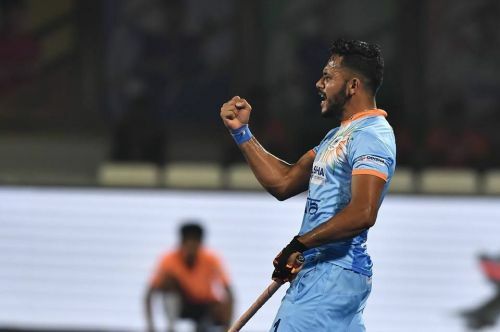 Harmanpreet Singh, considered India's trump card, didn't waste a single opportunity into converting that penalty corner into a brilliant goal, earning India a lead of 1-0. With an upbeat spirit, India looked all set to dominate the first half, having earned a goal within the first quarter and denying Canada any important breakthrough throughout the 15 minutes. The Canadians, however, had other plans for Team India.